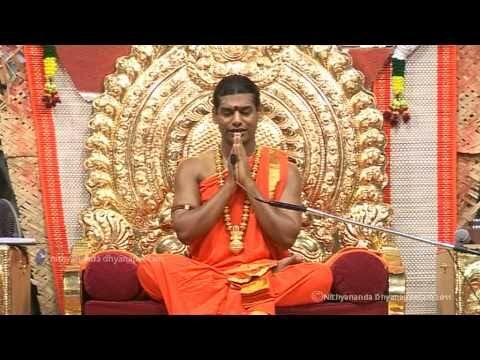 PARAMAHAMSA SRI NITHYANANDA on Don’t raise children in one’s own image TILL the age of seven, a child is like a sponge. Anything that the child is exposed to, the child absorbs. Its mind and body grows at an amazing rate. In this phase, the child is in the visualization phase. Whatever the child sees is imprinted and embedded into its unconscious. The embedded memories start replaying as the child grows into an adult. These embedded memories drive adult decisions. Between the age of eight and 14, the growing child is in the verbalization mode. The child starts learning languages and verbal imprints, not merely visual images, start getting embedded. Using words like happiness, suffering, etc., instantly evoke appropriate pictures and therefore emotions. During this entire period, the child is controlled by its parents or parent substitutes. Most of what is embedded in their unconscious comes from the elders close to them, mainly parents. So, children imitate their parents. People ask, do we inherit the sins of our parents? Do their karma become ours? No, don’t worry; you do not inherit the sins and karma of your parents. But, unfortunately you do inherit something that is equally powerful; something that can either be very positive or very negative. You do inherit the mindset of your parents. You inherit the way they think and act. You inherit their values and beliefs. You get conditioned by them. You inherit the mindset to commit the same sins, to inherit the same karma. So, I say again and again, be careful as parents in how you bring your children up. If the mother always complains, whether of a headache or the husband or the neighbour, the child learns the words and the behaviour. If the father coming home flops down on the sofa at seven in the evening saying he is tired, the connection between seven in the evening and tiredness becomes hardwired in the child’s mind. If a father comes home and displays keen interest in playing with the child that behaviour too is imprinted. Why is it that you rarely see an ugly child? Why is it that you rarely see a beautiful adult? If a child is being natural and playfully rowdy, we cannot tolerate such behaviour as an adult and we must control. We have to make the child as insipid as we are, as ugly as we are. Let them be natural. Let them grow into beautiful adults. It is in your hands to do that. Real love is something so deep and energizing that you will not know it unless you experience it.